When I woke up on Saturday morning I had no idea I would be baking shortbread. At that point I didn’t even have any intention of baking. I did have intention of finally deciding what to cook for Supper Club next week & what to do with some beautiful quinces that I was very excited to come across at the local vegetable shop. I remember a few years ago having to drive across town & out to the countryside of west Auckland to get my mitts on some of these beauties & now they are just around the corner at the local veggie shop. And what might you ask does all the have to do with shortbread? Well I was flicking through books & picked up Peter Gordon’s a Culinary Journey. I was immediately lost in the likes of five spice roast crispy pork belly with apple & sweet potato mash, roast shallots & coriander salsa verde or chilled avocado, kumara, coconut & ginger soup with radish or duck & coconut laksa with grilled sweetcorn, soba noodles, squid & coriander. Peter is our own Kiwi master of fusion & concocts some wonderful flavour combinations. I then stumbled across lime, clove & pine nut shortbread & I just had to head in to the kitchen to bake. Lime & cloves? In shortbread? For whatever reason it appealed, a lot, & needed to be sampled as imminently as possible. In my perusing I did also decide what to cook for supper club next week & how some beautiful quinces will feature. Those are posts for a another time. In the meantime please bake some of this delectable shortbread, pop the kettle on & settle in for a refreshing cuppa & little treat. Place the butter & sugar in the bowl of a mixer & beat until the sugar is dissolved & the mixture is light & pale. Sift in the flour, cornflour, salt & cloves. Add the pine nuts & lime zest & gently bring the mixture together gently with your fingers. Mix just until it comes together & don’t over mix it. Place the dough between to sheets of baking paper & roll it out to 1 cm / 1/2 inch thick & a roughly rectangle shape. Remove the top sheet of baking paper & place the dough on a baking tray. With a blunt knife cut 20 fingers or rectangles or actually whatever shape you would like. Place the baking tray in the fridge or freezer for 20 minutes to firm up. Remove the tray from the fridge & gently pull the fingers apart as they will spread a little when baking. Prick each finger a few times with a fork & sprinkle with a little sugar. Place in the oven & bake for 20 minutes until pale golden. Remove from the oven & let them cool for 10 minutes or so before transferring to a wire cooling rack to cool completely before enjoying with a cuppa. These will store in an airtight container for up to a week. Well, I was quite proud of this baking achievement! My cold hands are a definite plus when it comes to shortbread & this shortbread was buttery & crumbly shortbread perfection with just a whisper of clove & a breath of lime. 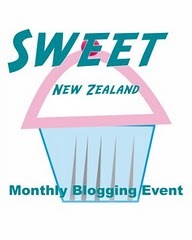 This is my entry for this month’s Sweet New Zealand being hosted by Monica over at Delissimon. Mmm, yum. Do love shortbread and those flavours! Thanks Lesley...it certainly didn't last long! Thanks Alessandra...trust the Italians to come up with such a gorgeous flavour combination. I hadn't come across it before & very happy I have now. Wonderful looking shortbread, Mairi - an intriguing flavour combo. Can't wait to see what you do with the quince. I got some at the market last week, and scored a nice haul of them foraging in the countryside. Thanks Mairi, got your entry! This looks SO delicious. I love shortbread, but these flavour combos sound so gooooood!